Juan Dingo has uploaded a new combo tutorial for Injustice: Gods Among Us. 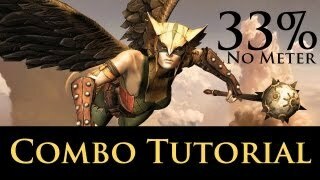 Hawkgirl players may find the meterless combo tutorial to be beneficial. Hawkgirl players now have a new go-to video for a short but effective combo. Juan Dingo is the provider of this short tutorial and he goes over how to land a meterless 33-percent combo with the DC Comics stalwart.